Copan is known for the rich detail of its carvings, including the famed Hieroglyphic Staircase. Many stelae have survived in reasonable condition, and can be found on the roads leading to the city as well as in the sculpture garden that has been created in one of the plazas. 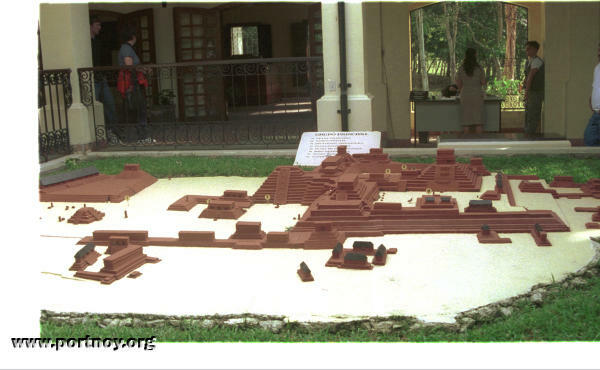 It was occupied from 400-800 AD, during the Classic Maya period. The ruins were never truly lost, and were mentioned in early documents after the Spanish Conquest. Modern excavation began in the 1840s. Since that time ongoing work has revealed an extensive site, including residential suburbs and farmlands. Tunnels dug under the temples reveal successive layers of consruction -- even the ball court is the fourth on that site. The museum on the site is excellent, housing both carvings discovered on the site and a reconstruction of the Temple Rosalila. This was found inside one of the temples in its entirely, unusual for Maya construction.